In November 2017, scientists pointed NASA's Spitzer Space Telescope toward the object known as 'Oumuamua—the first known interstellar object to visit our solar system. The infrared Spitzer was one of many telescopes pointed at 'Oumuamua in the weeks after its discovery that October. The new study also suggests that 'Oumuamua may be up to 10 times more reflective than the comets that reside in our solar system—a surprising result, according to the paper's authors. Because infrared light is largely heat radiation produced by "warm" objects, it can be used to determine the temperature of a comet or asteroid; in turn, this can be used to determine the reflectivity of the object's surface—what scientists call albedo. Just as a dark T-shirt in sunlight heats up more quickly than a light one, an object with low reflectivity retains more heat than an object with high reflectivity. So a lower temperature means a higher albedo. 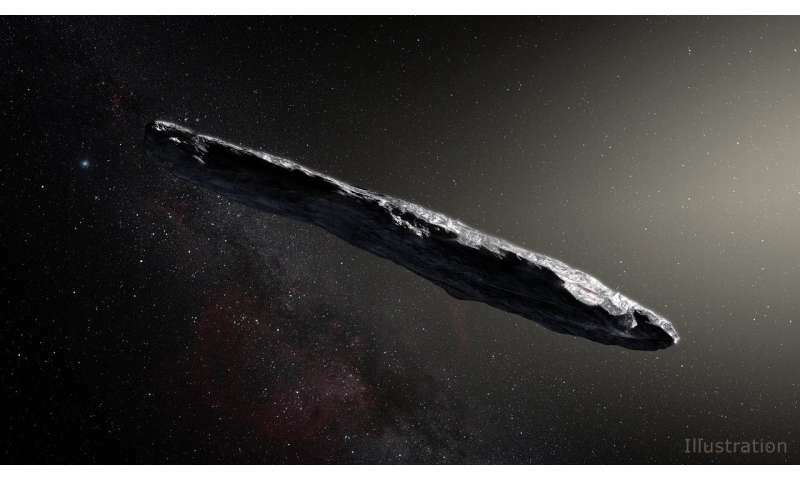 'Oumuamua had been traveling through interstellar space for millions of years, far from any star that could refresh its surface. But it may have had its surface refreshed through such "outgassing" when it made an extremely close approach to our Sun, a little more than five weeks before it was discovered. In addition to sweeping away dust and dirt, some of the released gas may have covered the surface of 'Oumuamua with a reflective coat of ice and snow—a phenomenon that's also been observed in comets in our solar system. 'Oumuamua is on its way out of our solar system—almost as far from the Sun as Saturn's orbit—and is well beyond the reach of any existing telescopes. Except there was no visible offgassing. Funny how half these articles articles conclude with what boils down to "well, it's gone for good now." Pretty sure someone somewhere is still watching it. The thing that constantly amazes me is how ignorant trolls and cranks are of how big things are. You can walk around the Earth in 5 years or so, even with water, pee, food, and sleep breaks. Guess how long it would take to the Moon at this rate. It'd be doable within a lifetime. I keep thinking about what would it take to run it down and catch Oumuamua. Apparently, too much. Maybe we should consider Oumuamua to be a reminder that chemical propulsion in space is extremely limiting. We need strong nuclear propulsion not just for fast, crewed missions to Mars, but also for giving us the flexibility we need to really explore the solar system and take advantage of opportunities out of reach with chemical propulsion. 1: Is it possible the UFO's rotation was orthogonal to the direction of motion? 2: Is this the type of mechanics you would use to generate an artificial gravity? +/- 0.1 years or so. Any idiot can use a calculator to divide one number by another, and quote all the numbers after the decimal place as if they were somehow significant. In this case, anything after the first or second (take your pick) decimal place in your quoted number is meaningless fluff, since you haven't factored in uncertainties in the users' speed, or in the earth-moon distance. In the first instance, the original specification was that the person take five years *or so* to walk around the earth (at the equator? ), so there's a good degree of uncertainty right there in the walking speed. Secondly, the moon's orbit is an ellipse, with eccentricity 0.0549, so there's more uncertainty. The best one could say in this circumstance is what @wg said - roughly 50 years. Your quoted figure is meaningless, and you should learn the difference between apparent and real degrees of accuracy. Invisible exhaust/coma, Almost as funny as the invisible light sail! We have seen, close up & personal, that the surface of an asteroid can be swept clean of dust bunnies and peagravel. I think the cause is my "Carpet Beater Scenario". Another random rock bumps just hard enough to make the small crap jump far enough to escape the big rocks micro-gravity. The speculation that Oumuamua is a comet? Now claims that the interstellar hermes did not outgas because the surface is frozen solid? That kinda spoils the fantasy that there were jets "steering" megatonnage of solid rock. Without being observed. "Okay, now pull the other one!" I'm still waiting for someone to do the math of how much the delta/v budget, the mass of reaction matter, would have to be to steer a megaton of rock. But it takes a fair bit of intelligence to comprehend sarcasm. Especially when Oumuamua was coursing away from the Sun. All that energy applied from Solar radiation? And no visible coma? So, on that evidence, no ice. Just a solid chunk of core nickel-iron. Which traveled too quickly by the Sun to have time to heat up. Which explains why Oumuamua is not visible om infra-red. And uncertainty of it's present course due to unpredictable gravitational tug from the planets. Yes Mark, we should have nuclear powered, robotic manned, deep space craft for such missions. With a picket englobement of Early Warning Satellites. One set around the Earth/Luna and another around the Solar System. However, all that is dependent on making the International effort to build an infrastructure of orbiting automated factories. Once past the cost of launching the original Mother factories? It should be mostly self-sustaining accessing space resources. Except for specialized equipment and technical upgrades from Earth. Seems the evidence converges. The interesting thing is to see the next one - if they pass once every year and we now have telescopes covering that size range it should not take long to understand the distribution.
? It was an IFO, a likely comet. IIRC it was seen tumbling chaotically, which seems typical for non-spherical objects in space. It is the classical rotational mechanics that every natural non-spherical object obey. Of course, as a jetting comet it seems to have gotten a gas assist that imposed more or less rotational (and translational) momentum every now and then. Newton 101. I still keep thinking about what would it take to run it down and catch Oumuamua . . .
Perhaps a series of flybys in the inner solar system could get a probe up to speed? I am not sure whether some combination of Earth and Venus flybys could impart enough velocity along a similar trajectory for a probe to catch up, but it would have to be a very cleverly crafted trajectory, if it could be done at all. 1: But it takes an even greater idiot to fail to realize my calculation is arrived at using the average of the max and min distances divided by the earth's circumference. So no, 50 years is not a better number. 2: Many idiots begin their flawed arguments with "Any idiot". They do this as an emotional appeal because the use of logic is a concept they will never understand. 3: I am sure you have mastered the use of a calculator. They have actually invented something called the computer. This is what I used, along with a program named Octave. I have also used Octave to process signal data from the Allen Telescope Array and generate 3D surface plots. So my usage here was trivial. One point for you. This is what I used, along with a program named Octave. I have also used Octave to process signal data from the Allen Telescope Array and generate 3D surface plots. So my usage here was trivial. Oh, so not sarcasm. Well then, silly use of tolerances it is! Correction: Silly use of significant figures. How does a spinning oblong object alter its velocity vector without off-gassing or chemical engines? "Gravity-Assist Engine for Space Propulsion"
"'Oumuamua was too faint for Spitzer to detect when it looked"
Well, Mark, I can tell you that theyve figured out how to do this, and that its very easy to find on the web, for those of us who arent too lazy and stupid to look it up. Otto, as usual, you didn't look it up, provide a link or add anything other than vitriol. By your definition that makes you lazy and stupid. max, the "Gravity-Assist Engine for Space Propulsion" is not some sort of gravity/anti-gravity producing engine. It is not Perpetual-Motion bunkum. It is a space vehicle using any of a variety of recoil propulsion methods. Such as the ion engine in this article. But also chemical rockets or nuclear-electric. When checking out online material, such as wikipedia? Be cautious, they lock-in errors of fact. Don't accept a single source. Do not base your speculations on a clickbait headline. For instance, the erroneous claim that ion engines or other electrical drives do not consume reaction mass. "TANSTAFFL" Those aggravating Thermodynamic rules of thumb, will always collect the debt you ran up. With stiff penalties of mounting interest. Another term to watch out for is "delta/v". It should be used as "delta/v budget". Figure the cost per payload. Betcha polished chrome-moly would 'reflect' a LOT. Something a quarter mile long would take 'significant' thruster force to revector it. Changes in reflectivity could also imply a 'delta winged' or other morphology that rotated along its principle Veloc vector resultant as it 'faced' its cameras and antenna arrays toward Earth and Ceres and other undiscovered to us outposts.